that the Comex could have a flood of inventory in order to fill orders beginning July 21st , possibly as a deal cut with another source. 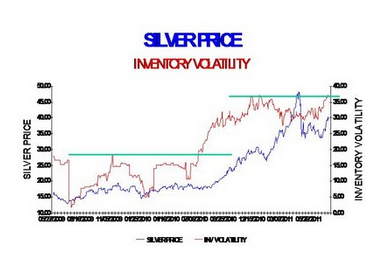 Perhaps the SLV will bail out the Comex just in time as it looks like the demand is about to kick in gear.SilverDoctors also posted a breakout in the inventory/price volatility, comparing the breakout to last year when the price went from $18 to $35 before it started to level off in March. Watch for big moves July 20-25th. There will most likely be an even bigger move July 28th. Thanks Karen. As always, very informative. I am concerned that the next run up in silver prices will draw a lot of attention towards the SLV and its ability to account for the bullion it says it has. While the security of owning the physical cannot be replaced, nor can the leverage one enjoys through trading paper products. So with that said, would the default of an institution (if you want to call it that) like the SLV be something that financial astrology could predict or is that something that is too “micro” in nature? I’m curious to know what is your astrological perspective on that. Thank you! I understand your concern. You could use PSLV( Sprott physical silver trust) instead which is 100% backed by silver. To answer your question about default, yes I would be able to see that and right now what I see is delivery issues however at the same time a flood of silver (Jupiter in Taurus) so, for now I would say no default. Into the Future 2014 looks CRAZY!! I just want to tell everyone who has been following my articles and trading silver since I started writing here the first week of June. I know many of you have done very well with your silver trades and for that reason I am very happy for you all. Karen… I have no doubt 2014 has to equate to something close to mayhem relative to what we are accustomed. This entire year I’ve been saying that in 2-3 years time something has to be hitting the fan 🙂 And that’s just from a physical standpoint. I study spirituality and from a meta-physical standpoint what you say pretty much lines up with anything I have heard thus far in terms of what the age of Aquarius will bring. Thanks for your tip on PSLV. I took a look at it recently and unfortunately it doesn’t seem to have options trading (maybe that is a testimony to its legitimacy lol). I think that what I’m going to have to do if I want to keep taking advantage of leverage is move into some of the miners and profit from rising silver prices in that fashion. Eventually anyway as it’s not my preference. When silver prices start making all-time highs I’ll have to track you down and ask, “So how about that default now?” I just don’t see how this imaginary (paper) silver market has any sustainability to it. Something has to give. It’s thin air. But yes, we have done great with your advice and we thank you! You’re awesome! A great weekend to as you as well. Justin, thank you for the comment and you are very prescient! I think you are exactly right, the bigger move is in late August. You sort of jumped the gun here as I plan to write about it soon. The move now is positive as I predicted so far. There are blogs out there reporting earlier this week bankers with massive shorts trying to gap down the metal (complaints to CFTC) but it didn’t work as we see in the chart. I believe the transits I explained actually helped the price a lot, instead of showing a correction. July 28th does look very bullish to me also. I’m tracking Silver and Gold and Rare Earth and so far you’ve been spot on. I’m looking forward to you future comments. Light ahead.